What is the Galaxy Fold, Samsung's Foldable Phone? Samsung’s foldable phone has long been the subject of rumors, and they finally came to fruition in February 2019 with the announcement of the Galaxy Fold. The Samsung Galaxy phone transforms from a 4.6-inch smartphone to a 7.3-inch tablet and back again, all without interrupting what’s on the screens (that's right, there's more than one screen). While Samsung introduced the Galaxy Fold at an event alongside the Samsung S10, the Fold isn’t part of the Galaxy S family; it’s in a whole new category. Available in April 2019, the Fold's price starts at $1,980. The Galaxy Fold launches with Android 9.0 and Samsung One UI and sports 512 GB of onboard storage and a whopping 12 GB of RAM. The smartphone has two batteries with a total capacity of 4380 mAh that can communicate with each other. There is no SD card slot. 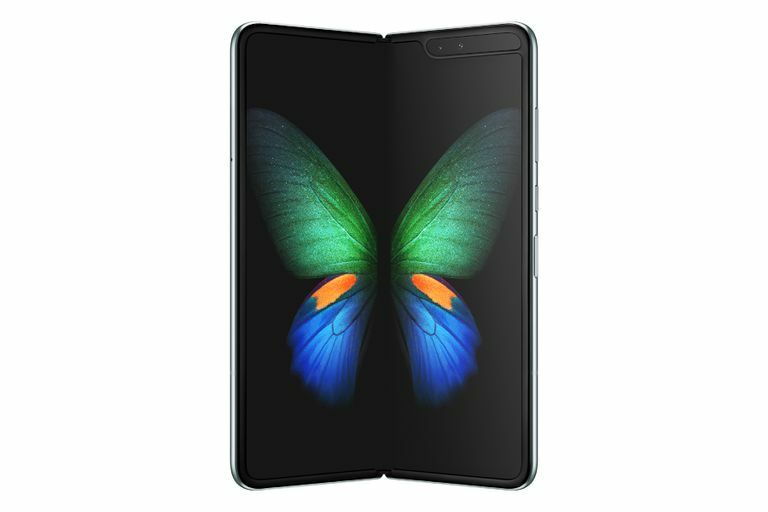 According to Samsung, the Galaxy Fold will be in limited supply, in part because it's a premium device and likely won't sell as many units as the Galaxy S10, but also so that the company can provide concierge-level support to those who do purchase it. In the U.S., the Fold is on AT&T and T-Mobile and comes with a pair of wireless Samsung Buds. You get a choice of four colors (cosmos black, space silver, Martian green and Astro blue) and the opportunity to customize the color of its hideaway hinge. Get a closer look at the Samsung Galaxy Fold. The Samsung Galaxy Fold's screen is dubbed the Infinity Flex Display and is not made of glass like current smartphones. Samsung claims it's both flexible and durable. The display is about 50 percent thinner than average and opens and closes naturally using a hinge that hides away when you unfold the smartphone. The smartphone’s fingerprint scanner, which doubles as a power button, is designed to line up with your thumb when holding it with one hand. Putting the sensor on the side of the phone makes it accessible whether the phones folded or unfolded. When you unfold the Galaxy Fold into a tablet, its app continuity system makes the experience seamless, automatically resizing the active apps to the larger screen. Additionally, you can display up to three apps on the screen at a time, and even use other apps during a video call. Like all Galaxy phones, the Fold works with Samsung apps including Samsung Pay, Samsung Health, and Bixby, its virtual assistant. You can also pair it with Samsung DeX to get a desktop-like experience. The Fold has a system of six lenses, three in the back (12MP primary, 12MP telephoto, 16MP wide), two on the inside (10MP selfie, 8MP depth), and one on the cover (10MP selfie), so you can capture photos whichever way you hold the smartphone, whether it’s folded or unfolded.